On April 11, 2018, King Gambrinus Day, Restore The King received a fund-raising challenge from a donor who wished to remain anonymous. 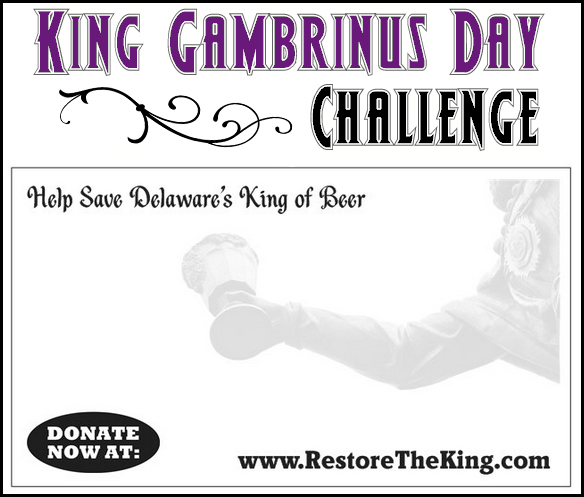 The individual pledged to donate $5,000 to the campaign provided Restore The King could obtain $5,000 in matching funds by the next King Gambrinus Day, April 2019. That day is now here. We could really use your help now. 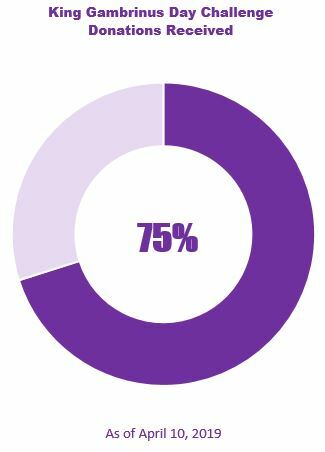 At present, the Friends of Gambrinus have raised $3,731.67 or 75% of the targeted goal. We are just a bit over $1,200 short of the goal. Help us turn $5,000 into $10,000. If you have value our campaign and would like to help us restore Delaware’s king of beer to his rightful throne, making him available for all of the public to enjoy, now is the time to contribute. We simply cannot keep this campaign moving forward and renovate this historic Delaware icon without your support. Yes, every dollar truly does help us inch towards our $5,000 goal, no matter if it’s $1 or $100. Won’t you please contribute by placing a secure donation? The Friends of Gambrinus is a non-profit organization and your donation may be tax deductible.